As Peter Gray points out in his book Free To Learn, our current educational system is based almost entirely on habit. It is not based on research, it is not based upon evidence, it is not based upon how humans learn, but rather upon notions of efficiency derived from the Industrial Revolution. Of course, there has been research performed upon children attempting to learn within this system, in which it's been demonstrated that tweaking things here or there will produce marginal learning gains, but that's like studying tigers in the zoo then claiming to understand tigers. Of course, if you want to really understand tigers, you study them in the wild. And there have been researchers who have studied children's learning "in the wild," starting with such great names as Piaget, Vygotsky, Montessori, and Dewey, research that has been continued right up to our times. 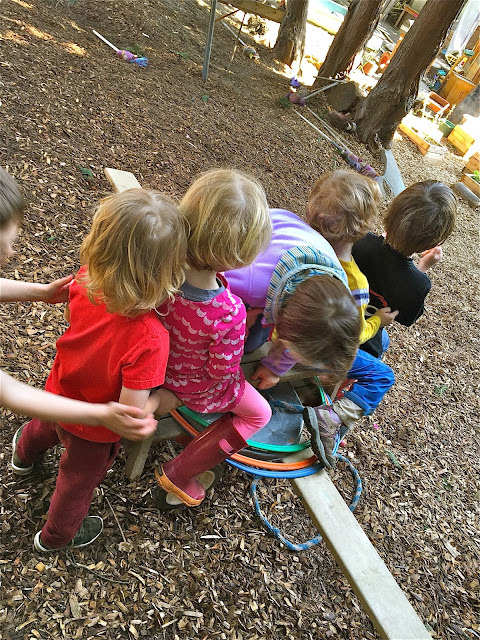 All of that research tells us we are doing it wrong; that if we really want to provide the best conditions for learning, we must break the habits of assembly line thinking, and instead adopt a child-lead approach, one embodied by play-based preschools and democratic free schools, places where children are free to seek answers to their own questions. I finished last week with a post which was essentially an architectural "wish list" of what I'd like to see for our Woodland Park Cooperative School if money was no object. As folks chimed in with their own ideas, many, not surprisingly, strayed into the broader definition of what the Reggio Emilia model refers to as the "third teacher," into things like higher teacher pay and other structural changes they wished for our school system at large. I thought today that I'd take a crack at expanding upon those comments by playing the same game I did on Friday, except this time I would re-imagine public schools as if overcoming inertia were no object. I'll start by asking the question: Why do we the people educate our children? Contrary to what our political and business leaders with their fantastical "jobs of tomorrow" will tell you, the purpose of public education is not primarily for vocational training. If that were the reason for public schools, I would agree with those who say we ought to get rid of them altogether and let corporations train their own damn workers. No, the driving public interest in educating our youth is that the ongoing experiment of democracy, the dream of self-governance, can only work with a well-educated population. The purpose of public education is citizenship. If that's the case, then the next question is: What are the characteristics of a good citizen? First and foremost, a good citizen is a critical thinker, a person who can listen, discuss, and share, but will ultimately think for herself. A good citizen is someone who asks a lot of questions and who knows it is not just his right, but his responsibility to question authority. A good citizen knows that she owes it to everyone to stand up for what she believes in even when everyone else disagrees; and the flip-side of that coin is that a good citizen knows it's important to respectfully listen to those with whom she disagrees. A good citizen, ultimately, is a person who contributes to our society in ways other than his narrow economic self-interest: socially, artistically, politically, spiritually, and as a member of communities both small and large. These are the kinds of self-directed people I want helping me in the collaborative project of self-governance. So what would these schools look like? For this, I'll borrow freely from my own experience as a play-based preschool teacher and from what I know of the democratic free school movement. Physically, I would imagine them looking fundamentally like the school I described on Friday, expansive, free-flowing places, where neighborhood children of all ages come together and actually get to work on the project of self-governance, practicing the skills and habits of citizenship. There would be no set schedule, or classes, or curricula, except those that emerge from the children themselves. Adults would be present for the purposes of safety, of course, but their primary role would be to support children as they pursue their "happiness," within the the context of community, helping them when asked, working to secure necessary resources, scaffolding inquiries, and stepping in to assist with strong emotions and heated conflicts. Children would not be divided up by age and subject, but would rather organize themselves around their interests, their questions of the moment, going deep or going broad as their temperaments and passions dictate. There would be nothing compulsory about these schools, other than the community meetings during which the children would settle overarching conflicts and make their agreements (their democratically determined rules) for how they want their society to operate. The adult staff would be members of the community in which the school is located. In fact, if I had my way, comfortable, middle-class housing near (or even on) campus would be provided as part of the compensation package. Pay would be sufficient to afford a comfortable living, indexed to the local cost of living, and would, of course, include health care and a good pension. Naturally, I'm an advocate for parent involvement and as such, the campus would be open on evenings and weekends, both for children and their families to congregate and engage in parent education and other enrichment opportunities, or to share their skills and knowledge with the rest of the community. In fact, I would envision these public schools as the hubs of their communities, literally placing education at the center of society. And I know it's a radical idea, but I would have no problem with literally paying parents to be active in their children's school lives, at least those of meager economic means who might otherwise have to sacrifice income in order to participate. In line with that vision, state provided school funds would be the sole responsibility of the students, parents, and staff of the community school, and those schools would therefore reflect the values of their community rather than the standardized cookie cutter data mines the corporate reformers envision. And likewise, when it comes to assessments, I would imagine that being a natural function of the ongoing community dialog because, after all, we the people should always be the final arbiters. I can't imagine that any this would cost more than it does now. In fact, I would assert that an educational system based upon democratic communities would cost far less and would produce far better results in terms of citizenship than even our "best schools" do today. So, this is my starting point. I'm sure I left things out. Please chime in with your ideas in the comments.